At O’Grady’s Landscape, we offer fertilization services to homes throughout Great Falls as part of our comprehensive lawn care packages. Proper fertilization is critical to maintaining a beautiful landscape with healthy turf or lawn and plantings. As the area’s trusted landscaper since 1991, you can rely on us to use only the most effective techniques and high quality products to get the job done right. Let us take care of fertilizing your turf or lawn so that you won’t have to—call (703) 533-5001 to schedule service today! When it comes to turf fertilization in the Great Falls, VA region, we recommend you schedule your service twice annually—in fall and spring—to promote growth and health year round. The cool nights and warm days of these seasons provide optimal conditions for maintenance, allowing the roots to strengthen and your plants to grow come sunnier months. Nitrogen to promote quicker growth and healthy, dark green leaves. Phosphorus to encourage root growth, flowering, and increases the resistance to cold. Potassium to increase strength and help your plantings resist wind, ice, and disease. Iron to allow the above nutrients to better access your turf; this is especially important when you have certain plants that can be prone to deficiencies. Keep in mind that shrub fertilization is especially important for plants in the first five years of maturity and that smaller plantings will require more supplemental feeding than, say, larger trees. 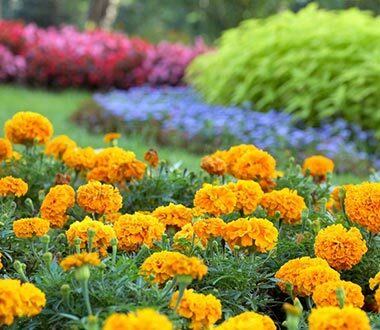 Our shrub fertilization experts in the Great Falls, VA area can take a look at your property and offer recommendations on the best fertilization schedule for you. We can also advise you on the best lawn care services to complement your new fertilization plan. Need Fertilization in Great Falls, VA? Get Your Free Estimate Today! If you are looking for a lawn care company to handle your fertilization needs, you’ve come to the right place. Improper fertilization techniques can lead to excess water, drowning your plantings, and causing more harm than good—so it’s important to choose a landscape company that’s knowledgeable and experienced. O’Grady’s Landscape has been fertilizing properties in and around Great Falls, VA for over 25 years, and we apply our expertise to each and every project. Let’s get your lawn in its best shape yet! Contact us online or call (703) 533-5001 to get your free estimate today!